TestPoint’s powerful Automated Functional Testing Plugin (Vansah ATSI) a synthetic application end-user performance monitoring solution which integrates with your functional automated testing tool. Now you can measure real user response times against your application either in TEST or LIVE end user environments! ATSI has been deployed successfully across large enterprise applications globally providing accurate and reliable performance response times. ATSI will deliver exactly what most organisations struggle to achieve. Access your data directly in your in-box or through the simple interface provided. ATSI has been deployed to integrate with your existing dashboard monitoring system. The timers communicate via ATSI subsequently collating your applications performance response times while driving the scripts using your automated functional testing tool. If you currently have invested time in developing your automated tests then the process of integrating performance synthetic monitoring will take moments and your now capturing data and reporting on your applications performance. Best of all ATSI allows you to report on performance responses according grouped by any environment configuration. Set Alerts when a performance counter exceeds a threshold. Capture screen shots when a performance response/counters exceeds the threshold. Create email alerts to notify key people when a threshold is exceeded. 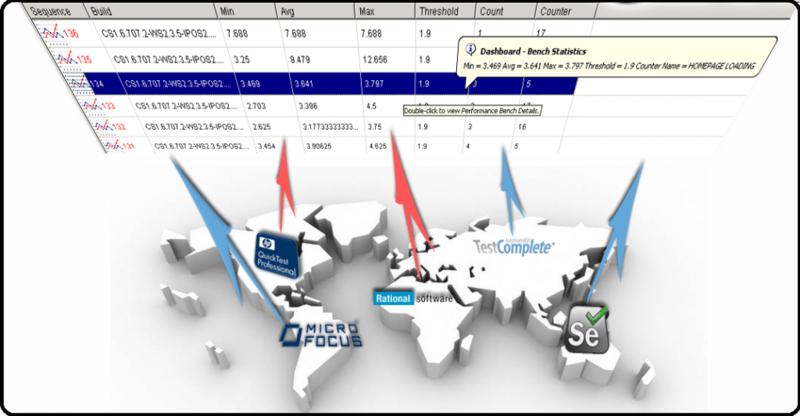 Execute your tests from any test agent and centralise your performance response times based on geographic locations/time and test agent. Run your functional tests in sync with your planned load testing effort and report back on real end user performance response times.